On June 17th Christie’s Auction House in New York will have a very special and super rare Panerai Prototype up for grabs. This prototype made entirely of bronze was produced in 1985 under the direction of Alessandro Bettarini. 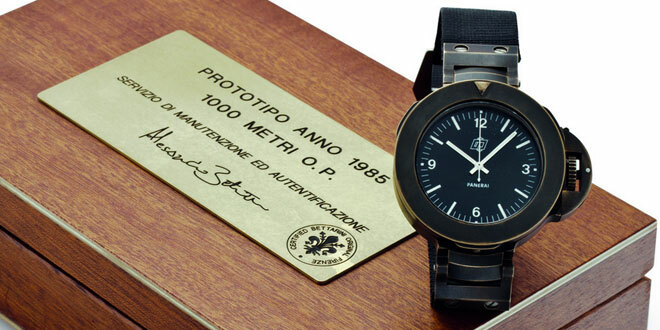 During the development of these utility pieces that were to be made for the Italian Royal Navy, they created 4 prototypes made of bronze and 4 out of Titanium. This piece featured a 47mm case and a large 5.1mm sapphire crystal which is also present on the case back revealing the caliber 2789-1 movement which powered this massive watch. One of the most popular pieces amongst Panerai collectors is the PAM382 & 507 Bronzo models, not only because of the amazing design but the one of kind patina each piece will accumulate over the years of wear. Like a finger print, no two bronzo’s will ever patina the same way. This is also true with this beautiful prototype which has aged gracefully like a nice bottle of wine since 1985. This prototype is definitely something you won’t come across too often because of the overall scarcity of the piece. Christie’s actually sold a piece back in November of 2014 for a then whopping price of $292,402 USD. Original Estimates were in the 80-120K range as compared to the 100-200K range for this particular piece. I will definitely be keeping my eye on this particular auction to see what the final hammered price will be.